TRUMBULL, Conn. - Aurelius H. Piper Sr., hereditary chief of the Golden Hill Paugussett Indian Tribe, died Sunday morning of natural causes on the tribe's reservation in Trumbull, tribal officials said. He was 92. 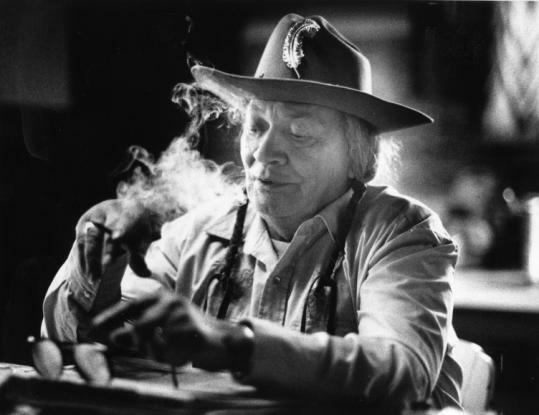 Known as Big Eagle, Mr. Piper was named chief in 1959 by his mother, Chieftess Rising Star, and later took over residence and care of the tribe's quarter-acre reservation in Trumbull. Though small, the tribe has been recognized by the state of Connecticut for more than 300 years and has small reservations in Trumbull and Colchester. In 2004, however, the US Bureau of Indian Affairs rejected the tribe's request for federal recognition. During the fight for recognition, the Paugussetts filed claims to more than 700,000 acres of land, setting off a flurry of legal challenges. The land claims, which stretched from Middletown to Wilton and from Greenwich through lower Westchester County in New York, were eventually dropped, but could have been revived if the tribe had received federal recognition. In 1993, Mr. Piper's son Kenneth, also known as Moonface Bear, was the central figure in a 10-week armed standoff between State Police and the Colchester faction of the tribe, for selling untaxed cigarettes on its reservation. Kenneth Piper died in 1996. Big Eagle traveled the world as a representative of the Golden Hill Tribe, Native Americans and other minority groups. He visited Moscow as part of a delegation of American Indian leaders and was the foreign correspondent for eastern North American tribes to the De Kiva Journal. The De Kivas are a group based in Belgium and the Netherlands, which takes Indian rights cases before the International Human Rights Council in Geneva. Mr. Piper served on many boards and commissions throughout Connecticut, fighting for the rights of American Indians and other minority groups. He also served as a spiritual liaison to Native Americans in prison. Chief Big Eagle was named Chief of the Century by the Florida chapter of the White Buffalo Society "for his work in furthering Native American causes in Connecticut, across the country, and abroad." He also served in the United States military during World War II, where he participated in the landing in North Africa, according to the tribe. He leaves his wife, Marsha Conte Piper; five children; and several stepchildren, grandchildren, and great-grandchildren. A traditional Native American memorial mourning walk will be held at 11 a.m. tomorrow beginning in Nichols Farm Cemetery on Shelton Road in Trumbull.